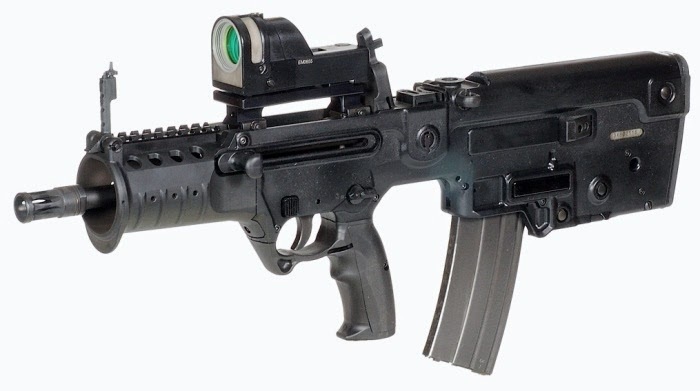 X-95 is next generation special forces firearm developed by Israel Weapon Industries, tailored specifically to deal with modern anti terror , urban as well as open area combat. The X-95 is ultra compact , light weight rifle having effective firing range of 500m. Advanced technology of this weapon allows interchangeability from 5.56mm caliber ammunition to 9mm caliber ammunition which enable commando to use weapon in urban and open area combat alike. Recently introduced new conversion kit for 5.45mm caliber ammunition makes it only weapon with 3 calibers. The weapon also have true 'over-the-beach' capability and thus it can be safely fired after being submerged in water and is not completely dry. This weapon is truly ambidextrous and thus can be used both by left handed and right handed shooters with similar ease.Another feature it that this weapon comes with rear center of gravity which enable rapid targeting and firing. Another feature of this weapon is that it can be fired using one hand making it ideal for soldiers operating in long treks in forests. Further this weapon can fire 240 round continuously. All the above mentioned features made this weapon first choice combat weapon of many countries. It almost looks like something out of a video game! Look at that rifle scope! That's awesome. A with such price ratio will uncover the potential of your more rifle in the best way. Of course it can cost much more but it should never cost less.